The more worrisome issue of this story is the one National Geographic did, showing how Skinheads have reached levels of the government and kill thousands of people each year in the US. Even more disturbing, even though the US government knows about these groups, they haven't allocated many resources to do anything about it. We can say for sure that if you changed the skin colour a shade darker of the men in the pictures of this story, and changed their religion, the government would act more harshly to stop these skinhead groups. A Secret Service agent holds the door for U.S. Democratic presidential nominee Barack Obama on his way to a campaign rally in Pittsburgh, Pa., on Monday. (Jason Reed/Reuters)U.S. authorities said Monday they have broken up a plot to assassinate U.S. presidential candidate Barack Obama and shoot or decapitate 88 black people in Tennessee. In court records unsealed Monday, federal agents said they disrupted plans by two neo-Nazi skinheads to rob a gun store and target a predominantly African-American high school. The skinheads did not identify the school by name, federal agents said. The two men planned to kill 88 black people, including 14 by beheading, said Jim Cavanaugh, special agent in charge of the Nashville field office for the Bureau of Alcohol, Tobacco, Firearms and Explosives. The men also sought to go on a national killing spree, with Obama as their final target, Cavanaugh told The Associated Press. "They said that would be their last, final act — that they would attempt to kill Senator Obama," Cavanaugh said. "They didn't believe they would be able to do it, but that they would get killed trying." An Obama spokeswoman travelling with the senator in Pennsylvania had no immediate comment. Attorney Joe Byrd, who has been hired to represent Cowart, did not immediately return a call seeking comment Monday. The investigation is continuing and more charges are possible, Cavanaugh said. Cowart and Schlesselman also bought nylon rope and ski masks to use in a robbery or home invasion to fund their spree, during which they allegedly planned to go from state to state and kill people, the court records say. 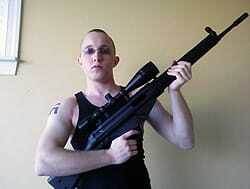 In this undated photo obtained from a MySpace webpage, Daniel Cowart, 20 of Bells, Tenn., is shown holding a weapon. Cowart and associate Paul Schlesselman 18, of West Helena, Ark., are being held without bond. (Associated Press)For the Obama plot, the legal documents show, Cowart and Schlesselman "planned to drive their vehicle as fast as they could toward Obama shooting at him from the windows." There is no evidence so far that others were willing to assist Cowart and Schlesselman with the plot, Cavanaugh said, adding authorities took the threats very seriously.